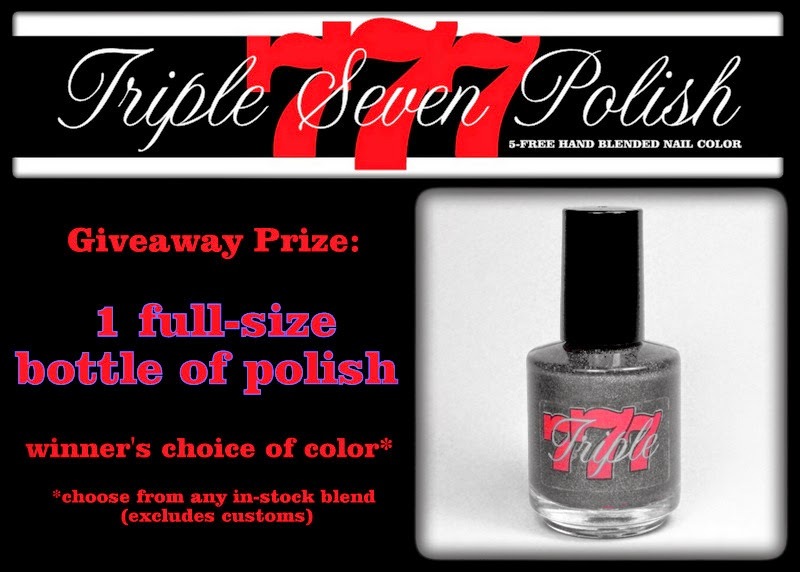 Today's giveaway is sponsored by the super-sweet fellow Libra girl, Tahlia of Triple Seven Polish! I'm so glad Tahlia reached out to me when I sent a call out for thise series of giveaways--we share the same enthusiasm and quirky humor so it feels like I've made a new maker girlfriend! Yay! Along with this giveaway, I will have an interview AND my very first review of some of her products (she picked three perfect shades for me!) up for you all shortly! In the meantime, take a look at what Tahlia has planned for 3 lucky winners! I love the look of Lounge Act and Smoke & Mirrors! Smoke & mirrors all day! Have to agree about smoke & mirrors. Great giveaway, as always! Smoke & Mirrors is definitely my fave! As soon as the page opened, my eyes went BOING! Love it! The Nightlife is such a gorgeous shade! Lounge Act and The Night life! I love Bankroll! Thanks for the giveaway! I can't pick one or two, more like 5. xD Payout Paradise, Poolside Cocktail, Lounge Act, A Dustland Fairytale and The Nightlife! I'm in love with Smoke & Mirrors and Poolside Cocktail. I had yet to come across this brand and I really like the look of their polishes.